UE local 150, NC Public Service Workers Union has launched an exciting new campaign to organize a statewide movement of city workers. 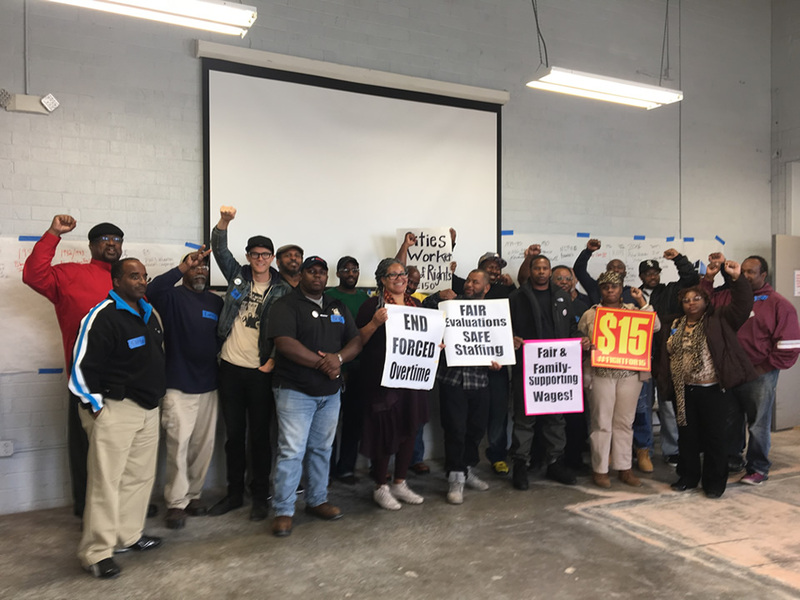 In Greensboro, several hundred workers have expressed interest in joining the union and formed a strong Organizing Committee over the last few months. Workers from cities across the state – including Charlotte, Greenville, Raleigh and Durham – gathered in Greensboro for a Statewide Municipal Summit on November 5. Outreach was done to workers in several other smaller cities such as Winston Salem, Rocky Mount, Wilson and Goldsboro. Building the statewide movement of city workers helps us to share these lessons and bring victories/standards from one city to ALL cities! UE150 see the fights as both with City Hall, but also the State Government! This past September marked the 10 year anniversary of the Raleigh Sanitation workers strike that rocked the state, resulting in not only the Mayor Charles Meeker riding on the back of a solid waste truck, but also recognition of the union payroll deduction, meet-n-confer system with Mayor, hiring all temporary workers as permanent and a back-pay settlement for stolen wages. Many of the lessons of this strike continue to be used in our current organizing campaigns, including how to build mass community support to advance the fight for collective bargaining for all public workers and building workers power. Meanwhile, the Charlotte chapter continues to grow as workers in the light rail “LYNX” department have joined the union in large numbers, showing the expanding base of power for our union in the city. In Greensboro, city workers have been meeting with Mayor Pro-Tempore Yvonne Johnson about several of their main concerns, including lunch breaks for solid waste workers while working their 10-hour shifts, and enforcing a city council resolution passed last year to bring workers up to at least $10 per hour (went into effect Sept. 2015 but no action yet) and to $15 per hour by 2020. But unless workers have a union to enforce changes, any city policy or resolution is worthless as toilet paper. Workers across the state, even without collective bargaining are continuing to organize for basic standards – a Municipal Workers Bill of Rights.